Simplify mud and clay mask removal with the GLOV Mask Remover, an innovative cleansing mitt designed to quickly and effectively remove face masks from the skin. 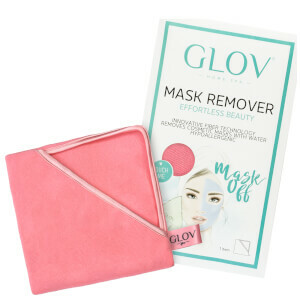 Made from special polyester fibre, the mask removal tool expertly draws and 'catches' the remains of your face mask without absorbing (so it's easy to clean! ); it expertly removes residue from skin's surface without compromising efficacy of mask ingredients. The fibres won't exfoliate skin, but instead slide over the surface, dissolving the mask without disturbing absorption. Simply use with water and reveal a clarified complexion. All you need to do is wet the glove with warm water and apply it on your face for a brief moment. You will feel your skin get pleasantly warmer – this means the mask has begun to melt. Now you can remove the mask, making circular movements on your face. Then just rinse the glove in warm water. The glove can also be cleaned in the washing machine (without softening agents).